Sitting at the airport in Los Angeles I caught Kia’s Cadenza ‘ blindfold’ touch test on a T.V. commercial, as parking valets guessed the brand of the car they were sitting in. BMW, Cadillac and Mercedes came to mind. As professional car jockeys experienced the cushy premium interior confines of Kia’ upscale offering, I reflected on the 2017 Kia Cadenza sitting on my Eugene, Oregon driveway. Without a visual side-by-side comparison to a luxury full size sedan, 2017 Kia Cadenza appears to rival a BMW 7 series, or a Volvo S90 in dimension and eye catching visual appeal. Designed by Peter Schreyer, Kia Cadenza captures the essence of European style, and does so at a premium midsize price point. Well balanced of body line, with just enough bling to announce the driver’s arrival into the premium midsize car segment, Cadenza eludes to a superior drive and ride experience, and does deliver with little compromise as to seat comfort, refined suspended ride quality, and reasonable on tap engine power. When we look to the total package presented, 2017 Kia Cadenza is a relative purchase value, in a segment dominated by Germans brands, and does so for well under $45,900. * Price as tested 2017 Kia Cadenza Limited. After driving most, if not all offerings in the premium midsize segment, I was taken by Cadenza’s artful combination of contrasting Gravity Blue on Diamond patterned “ White Package” power adjusted, heated leather seating. The visual is further enhanced with sharp contrasting Piano Black finished hard surfaces, leather like dash and wheel covering, tight pile carpeting, and a charcoal gray suede-like headliner. Accent lighting abounds throughout the cab, with thoughtfully placed chrome detailed pulls and transitional trim details. Looking to the exterior, I’ll let the photos do the talking. In one word, Cadenza is beautiful from every angle. Approaching Cadenza at night with smart key fob in hand activates the cabin lights, the visual is captivating, the full length moonroof, awe inspiring. Premium Seating: Without question, Cadenza sports the most comfortable seat in the midsize premium sedan segment. In the full back and seat back down position, a short nap is quite doable. (not recommended while driving) I found ample knee spacing between the driver’s seat and dash, and exceptional head, hip and shoulder room. The dash layout is pleasing, without being to technical. Kia kindly left some old-school knob control in Cadenza for the long tooth among us, with many features easily accessed from the smart steering wheel and front passenger seat. Kia is one of the last auto manufacturers to integrate a C.D. player into the entertainment array. I appreciate that. I found instrumentation, center i-MID, and the 8 inch static touch screen monitor to be near intuitive in operation. Cadenza accommodates smartphone, electronic device pairing and charging, front and rear. We took a moment to pair an iPod and Android Smartphone to Cadenza, it was all very seamless, all the way down to voice recognition. And of course, 2017 Kia Cadenza in Limited or SXL trim is maxed out with power everything, including a very spacious, carpet lined and light trunk -- no compromise. Occasionally, horsepower and torque numbers don’t adequately indicate the performance experienced behind the wheel. Such is the case with Cadenza. All Cadenza trim levels feature one engine and one transmission option. And, don’t look for all-wheel drive here, you won’t find it. Cadenza is front wheel drive, yet we didn’t experience any torque steer while driving Cadenza aggressively. And, it handled very well under wet-weather driving conditions. Claiming 290 horsepower and 253 lb-ft torque, Cadenza’s 3.3 liter 24 valve, direct injected V6 is quiet, while delivering power to the road through a seamless electronically controlled 8-speed automatic transmission. At first, I thought I was driving a V8, it’s that smooth and fluid. However, although paddle shifting comes standard, you won’t need it. Try as it may, this cushy 3700 lb sedan is not a sport-sedan, in the Acura, BMW sense of the word. 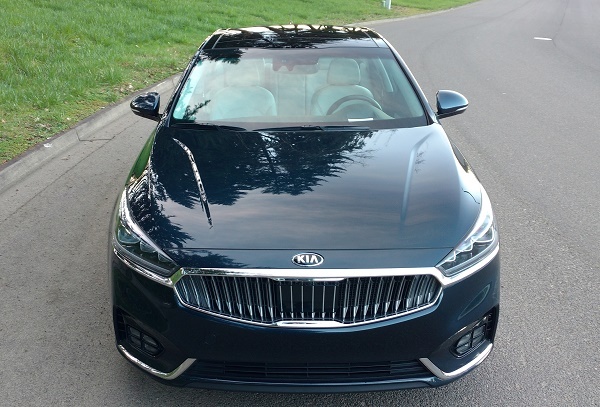 While engine output ranks with the best in the class, Cadenza’s rather soft long-range cruising suspension tends to bog and roll in tight, aggressive 2-lane country sweeps -- she’s a bit nose heavy, but very likable. Cadenza is happiest on the highway, and as comfortable as your leather clad living room sofa, or favorite office chair. She’ll carry 5 adults and their luggage to wherever. With automated 2nd row sun shades, your second row passengers will be napping as the miles melt away in Cadenza’s rear view mirror. 2017 Kia Cadenza is a bit fuel thirsty by today’s standards. The E.P.A. states 20 city/28 highway. The best fuel efficiency I witnessed in our two week visit with Cadenza was 21.3 mpg. As mentioned earlier, Cadenza is equipped with a 4-choice drive mode. For this test we drove primarily in “Smart.” What’s cool here, is the color changing indicator on the dash, making ease of fuel efficiency maximizing driving style, easy. I’d tighten up the steering wheel feedback and suspension a tad. That’s an easy fix. And for me, a car with steering wheel mounted paddle shifting should handle through the sweeps. That’s about it. Cadenza’s a great value for the dollar. I’d recommend a test drive to anyone considering a midsize premium sedan purchase.